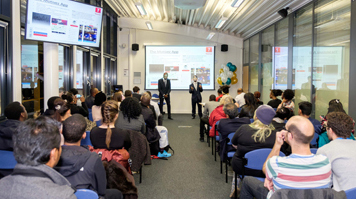 London South Bank University (LSBU) students Martina Eco and Jamie Walmsley, and recent graduate Chris Underdown have been shortlisted for the Institute of Directors (IoD) Student of the Year Award 2017 in recognition of their individual business start-up activities. The Award celebrates the achievements of students who have shown director qualities in a project they have worked on in a business, employment or academic capacity. The IoD is the UK’s longest-running organisation for professional leaders. They currently support 30,000 members by encouraging entrepreneurial activity and promoting responsible business practice. All three shortlisted candidates recently pitched to a judging panel at an IoD Assessment Day about themselves, their entrepreneurial journeys and their experiences in starting up their own businesses. “Having the opportunity to pitch in front of a panel of judges from the IoD is a great honour for me. Pitching is a good way to challenge myself and push my limits, and presenting my project and my business to the judges and getting feedback from them will be an exceptional learning experience. I hope to make it to the finals this year as well, and network with fellow student entrepreneurs at the awards ceremony". The Entrepreneurship and Innovation Institute at LSBU works with academic colleagues in all of LSBU’s seven Schools to support students like Martina, Chris and Jamie to start their own businesses and develop valuable enterprise skills. The team offers students and graduates opportunities to boost their practical and transferable skills through 1-2-1 support, competitions, free events and mentoring. LSBU supports students to be student members of the IoD giving them access to a professional network, expert knowledge and networking events. The winner of the Student of the Year Award will be announced at the prestigious Director of the Year Awards on the 22nd September at the Lancaster Hotel in London.